The Canny Crafters :: CRAFT CHATTER :: WHAT DO YOU WANT? I've bought a Happy Anniversary banner for Steve's parents' 70th: it has a heart between the two words and I want to add '70th' on it. I only have small number dies, so wondered if anyone has any between 1.5 - 2" high, please? I can do the 'th' with my tiny number dies, so no problem there. The banner is silver and I thought the numbers could be gold: would send the gold card, plus a cut-out of the heart for size estimate, plus the 'th' so that you could see whether it all fits, plus an sae for return. Hoping someone can help - thanks. Will try to remember to look Lynda, what's the deadline? 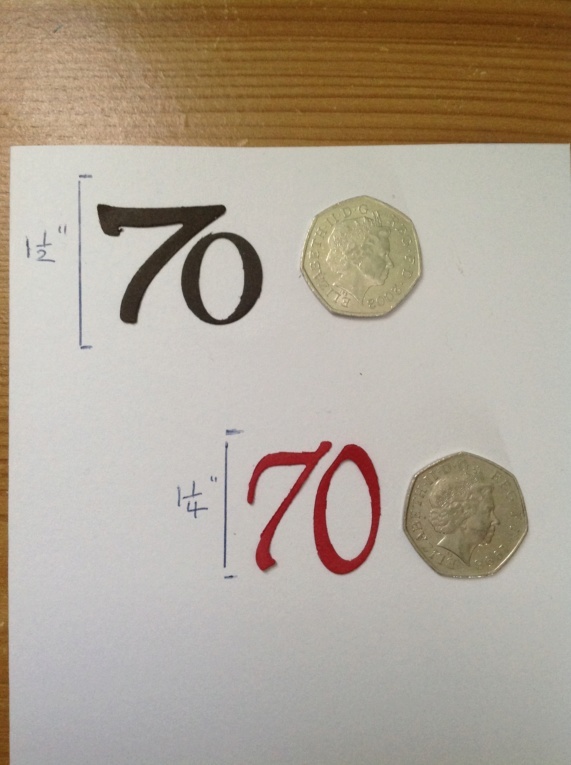 Could you separate the Happy and Anniversary and lose the heart, unless you want to keep that of course, then the 70 could be the same size as the letters in situ? I have a couple Sizzix alphabet/numbers. Can cut examples tomorrow and put pic on here with size. Thanks, girls: will wait to see your samples tomorrow, Di, and we'll take it from there. Font isn't really a problem, Karelyn - you can see how plain the banner font is! I did really want to keep the heart, as I think the '70th' will look good on it, and I don't want to make the banner any longer - was hoping to string it across the front of the buffet table, although it might be a bit long! The red zero is slightly longer so could be used with the largest seven. They're both really smart-looking, Di, and I like your idea of the black 7 with the red 0, if you see what I mean. I will send you the card etc, if that's OK, thankyou. Realised I forgot to answer Karelyn's question about deadline: we don't go until the 6th August for the party, so a few weeks yet. If there's enough card I will cut a couple of each and you can use whichever you prefer Lynda. Glad you are sorted Lynda, the ones I have are still packed away, but I don't think they would have been any bigger than what Di has shown you. Thought I'd look on eBay, just in case, Di, and found someone doing joined numbers (there's probably a proper word: concatenated?) - 8 of whatever two-number set you want, choice of card and colours, 2" high and not much more than it would cost me in postage two ways between me and you. If it's alright with you, I might go for those: hope I haven't caused inconvenience, should have checked eBay before. Thanks for all the trouble you went to. No worries. The bigger ones will probably be better, show up a bit clearer. Any problem you know where I am. Thanks, Di: am so sorry I put you to the trouble.